Arriving soon at a store near you? A tipster reportedly outed plans Friday for Microsoft to push the Surface RT tablet through retail channels outside official Microsoft Stores in the coming days. According to this squeaky wheel, Microsoft is about to commence a two-phase plan that will see the Surface RT and, eventually, the Surface Pro running Windows 8 available in electronics retailers all over the world. This process is set to begin in a matter of days, said the source, who added that the Surface retail rollout will begin in regions where there are no Microsoft Store locations. That initial push is phase one of a larger plan, the second part of which will reportedly kick off in January. Phase two of Microsoft's big Surface push will reportedly begin next month, when the Surface Pro is released. At that time, Microsoft will make both the Surface RT and Surface Pro available at retail locations including Best Buy and Staples, even in regions where Microsoft Stores exist. The Microsoft Surface launched in October, and so far it's only been available for purchase in Microsoft Store retail locations and from Microsoft's online store. Even with Friday's rumors, Microsoft has remained silent on the question of a wider retail release for the Surface, with spokespeople reportedly sticking to Microsoft's typical policy not to comment on rumors and speculation. First, that further reports have indicated that the Surface has not exactly been moving mountains as far as sales go, but that the reported push to other retailers could help mitigate that during the pre-Christmas shopping season. 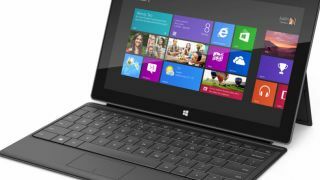 Indeed, reports at the end of November indicated that demand for the Microsoft Surface is weak. Second, the Microsoft Surface RT has reportedly appeared on the website of a French retailer, with a slightly lower price tag than Microsoft's official stores and expected delivery of Dec. 11. In addition, one Chinese retailer is reportedly already selling the Surface RT as well. If Surface tablets really are about to show up in retail stores, then Microsoft will likely make an announcement soon. Ears to the ground, people.